With a striking new design, the Quad Rack features two small manually activated vacuum bases per base, which offers a greater margin of safety over single vacuum bases and more than adequate holding power. The tall pillar allows for plenty of clearance between reels and the vehicle and can be bent to fit varying contours of a vehicle hood. We DO NOT recommend driving at highway speeds with your rods exposed for fear of damage to your equipment. For longer journeys, extended storage or theft concerns, we recommend the Sportube Master Series Double Haul; a modular hard-sided case for two fully assembled 9-foot or 10-foot rods and reels. 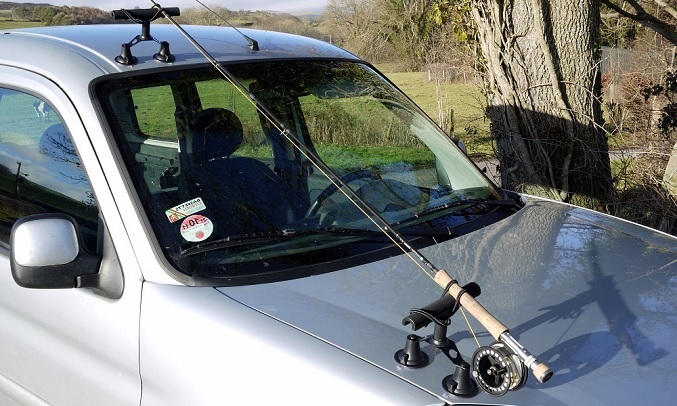 The Double Haul mounts and locks to most racks to protect valuable fly rods from theft, damage, dirt and wind.